The Stallions celebrate their berth into the state tournament. Tuesday could not have gone much better than planned for American Heritage-Delray. The Stallions proved true road warriors with a well-balanced but relentless attack, racing away to a 12-0 victory over the host Benjamin Buccaneers in a 4A regional championship. 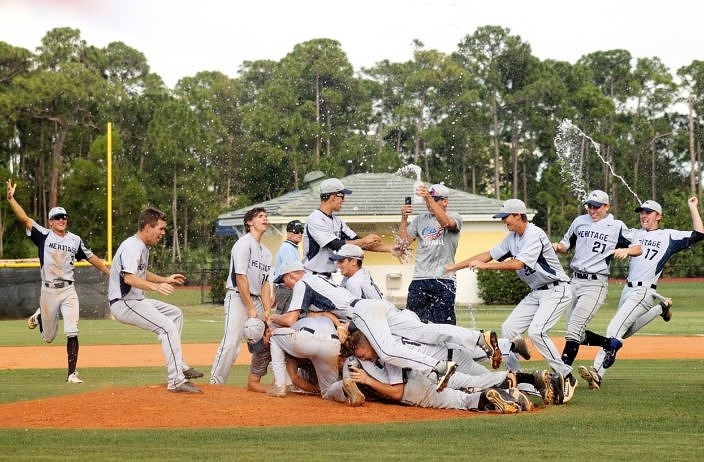 American Heritage-Delray advances to next week’s state tournament in Fort Myers, in a 4A state semfiinal against the Clearwater Calvary Christian Warriors. The Warriors (28-0) advanced with a 3-2 win over The First Academy on their side of the 4A bracket. For now, the Stallions (22-7) can enjoy the moments that led them to victory on Tuesday. Freshman left-hander Nelson Berkwich tossed a complete-game shutout, nearly every starter reached base and the defense did not commit an error. It was a family feeling for Coach Mazza and the Stallions at Jacobs Field, as many fans came out in support to pack the ball park. Over a dozen former players and other alumni also showed up in support. Berkwich proved very tough to hit, with a deceptive release and a ball that lived low in the zone. The southpaw scattered four hits over the five innings of play, striking out four without surrendering any walks. With a deep and proven arsenal of arms at its disposal, the Stallions trusted that Berkowich could provide a new look that was tough to figure out. Jack Keiser had two of Benjamin’s four hits. The Stallions wasted no time in staking their young hurler with a lead, scoring three runs with their first swings. Troy Hamilton walked and later scored on an error, Carmine Lane singled past third base and Nathan Zuckerman reached on a fielder’s choice to get it started. Jason Fox then supplied the first big dagger with a single to center field that drove in both base runners. 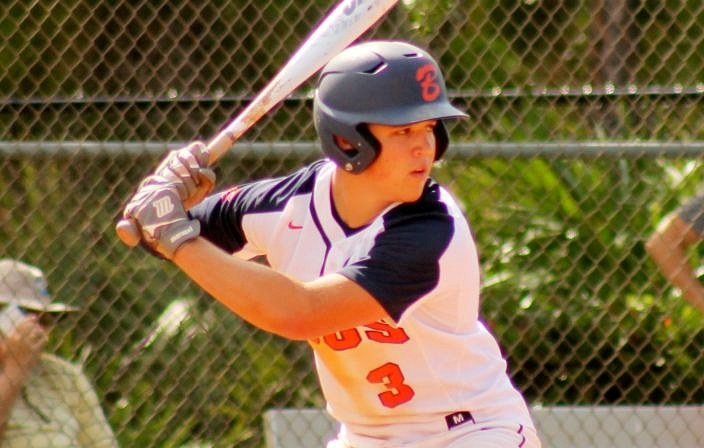 The Bucs battled to the final swings, threatening in the last inning when Jack Keiser and Nick Taplett both singled to put runners on the corners in the bottom of the fifth. Berkowich responded with two straight strikeouts that finished things off. Benjamin only threatened one other frame, as it loaded the bases in the bottom of the second inning. Aaron Steinhart and Keiser both singled, and Jack McCluskey reached on a fielder’s choice, but all three were stranded when Berkowich induced a swinging strikeout to end the inning. Nelson Berkowich tossed a complete-game shutout for the Stallions. Tthe Stallions added two runs in the third inning. Michael Malinchak collected the first of his two hits on the day and Jacob Lojewski walked, and Bailey Uderitz drove in both runners with a two-RBI single. 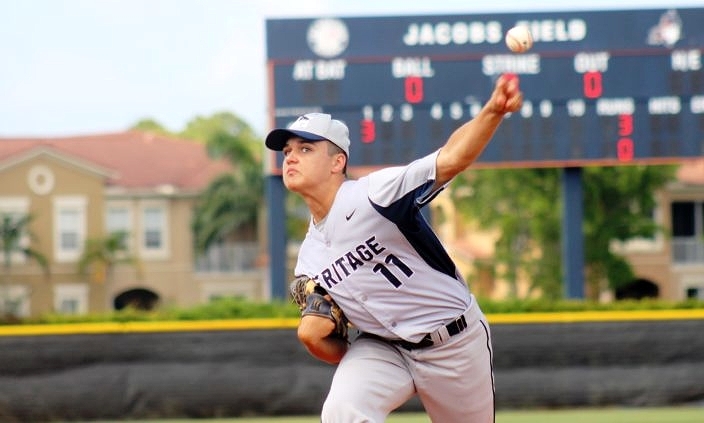 Heritage-Delray pulled away to victory by sending 12 batters to the plate and scoring seven runs in the top of the fifth. Hamilton, Lane and Lojewski all had RBI singles during the big inning that surpassed the mercy rule threshold. The coaches trusted Berkowich to close it out despite allowing two base runners in the fifth. Once he did, the young ace was tackled to the ground by his catcher as all of his teammates dogpiled on top of them to celebrate. “I had the whole team on top of me, but it’s not a bad thing,” Berkowich said.